For an urban planner, there can be no greater dream than building a new town from scratch. And for 44-year-old Michael Kabungo, that dream became reality when he took on the challenge of helping to build a town of more than 1,200 homes – complete with water, sewerage, electricity, shops, marketplace and recreation park – in the middle of the Bush. Kalumbila, in North-Western Province, is a project at Kabungo’s heart, and indeed he is jokingly called the “Mayor of Kalumbila” by the colleagues in his team, who have worked together to build the town from a greenfield site into a vibrant town that is starting to take on a life of its own. While the first phase of 1,252 houses is already complete – at a cost of US$85 million – the work never stops for the Town Services Superintendent and his team at First Quantum Minerals’ Kalumbila Town Development Corporation (KTDC). “In the new Kalumbila District, there was an opportunity to proceed from day one with thoughtful planning and, even more crucially, consensus among all stakeholders as to who should build what, and where. The key question – and is a big one – is how to maintain the right balance between proactive measures that serve the public good and a community’s need to grow spontaneously according to its own changing dynamics,” he explained. And indeed, “Work hard until you no longer need to introduce yourself” is one of only three posts he has found time to make on Twitter since 2014; a measure perhaps of how seriously he takes his own advice. As a young boy hailing from Mbala and growing up on the Copperbelt, Mr Kabungo had no idea that he would one day be working on such an enormous project, but his subsequent study and experience gave some clue to his future path. “I was born in Mbala, but moved to the Copperbelt when I was very young. I went to secondary school in Kasama at Lubushi Seminary with intention of becoming a Catholic priest. However, I later picked on Studying Urban and Regional Planning from the Copperbelt University before joining the Ministry of Local Government. However, that was a short stint, and moved to the Lusaka City Council where I first worked as a senior building inspector. “Thereafter I moved the Lusaka Waste Management Project which saw the setting up the Lusaka Waste Management Unit and later went to do my post-graduate study in Municipal Solid Waste Management in Germany, and later went to Sweden to study Urban Environmental Management,” narrated Mr Kabungo. Kabungo worked for the Lusaka City Council for almost 15 years before moving to Kabwe where he worked as Director of Planning before moving back to Lusaka then later moved to Choma in Southern Province to take up the position of Director of Planning upon relocation of the provincial capital of Sothern Province from Livingstone to Choma. This was his was his last posting in the civil service before moving into private consultancy. He said that it was after he ventured into freelance Urban and Regional Planning and Environmental Management consultancy, that he was approached by the Kalumbila Town Development Corporation to join the team the setting up of the new Kalumbila town. “Initially when I moved to the Copperbelt University I wanted to do architecture. But later on, during my studies and after doing extensive discussions with one of my lecturers Professor Taylor, my interest shifted to spatial planning which is on a larger scale than architecture. But at the same time, I also developed a lot of interest in environmental issues and that’s how I did a combination of urban planning and environmental management,” narrated Kabungo. 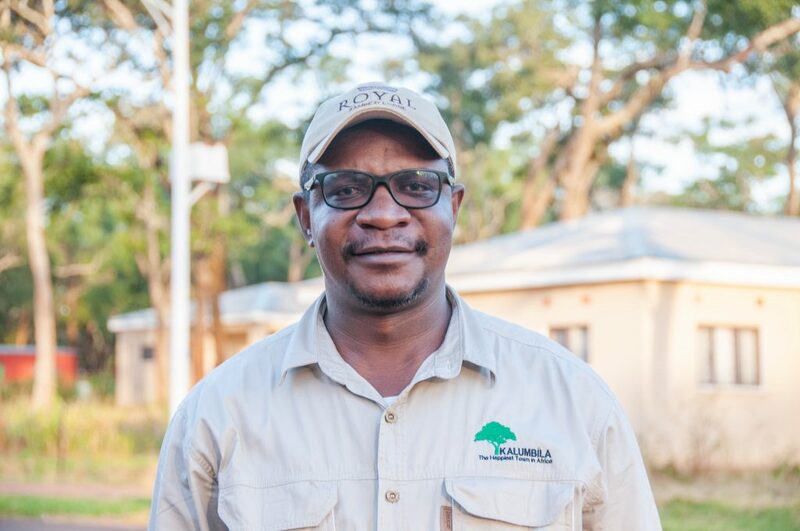 Kabungo’s vision of Kalumbila is to implement a well-planned, fully integrated town that provides a vibrant base for socio-economic growth – and that can serve as a model for such communities in Zambia and throughout Africa. “At the time I was joining, the original design had already been completed. I came in at the implementation and further development of the town was being done. Because I worked on already developed cities, it was exciting to come and work on a greenfield project, where you are a developing a town right from scratch. And there was completely nothing here and it has been quite an exciting experience for me to be part of this project,” he said. He explained that the long-term economic growth potential in Kalumbila District should not be narrowly considered as being mining only, but that businesspeople with a long-term view are encouraged to look at secondary economic activities triggered by the demand generated in the new Kalumbila Town, and that First Quantum has invested US$85 million in planning and development of Kalumbila Town. “Certain towns have a way of regenerating themselves and it all goes in how you design it. We have looked at a number of old towns that have regenerated over time, and those that have failed. Locally, in Zambia we have looked at Luanshya mine, which has had a lot of problems to regenerate itself because the town itself is located on a mine licence, meaning that the mining regulations and others are hampering the expansion and reinvestment in the town. Ndola on the other hand has regenerated itself in to a business, logistics and education hub long after the closure of Bwana Mukubwa Mine. With Kalumbila, the town is not sitting on the mine licence; it is one a separate title. So, as a result, all the investors with an investment are slightly distant away from the mine. The mine is like planting a seed, and the rest will snowball into development, initially supporting the mine industry, but is also creates a hub, Kalumbila, where it is located now, in like the shifting of the Copperbelt,” he said. Kabungo further explained that in developing the Sentinel Mine and Kalumbila Town, First Quantum hopes to help an emerging community control the unfettered development that has proved challenging in Solwezi. Describing himself as a person open to new challenges and meeting new people, Mr Kabungo spends his time away from work playing golf and visiting nature reserves. “When I moved here, I came alone – my family only came to join me almost a year later. And I can say that my family and I have adjusted well here in this new and beautiful town and the children have started going to school right here in Kalumbila and are enjoying the quiet environment from the hustle and bustle of Lusaka. “Development of Kalumbila Town is a long-term project which keeps evolving, and I hope to continue being a part of it. Where to after this? I still see myself continue being active in environmental management and spatial planning on a consultancy basis and do a lot more research into this sector were my passion lies,” he said.